In his political thriller, Incognito, Khaled Talib drew me hook, line and sinker into a world where I didn't know who was on whose side, or whom I could trust in higher levels of law enforcement and government agencies. 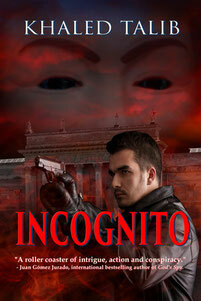 In its simplest plot, Incognito is about a Pope who was kidnapped and three people (living incognito, presumed dead) who were recruited to find him, hoping to spare his life. However, the story is much more complex as layer upon layer of violence erupts around them in their efforts to find the Pope. It seems their every move is being tracked and those in pursuit are adamant that the trio will not live to make it to their final destination, wherever that may be. Talib - having been an international journalist who traveled many countries around the world - has firsthand experience in witnessing the chaos which can erupt in the blink of an eye, and the ensuing fallout as one country retaliates against another while innocent people get hurt in the midst of their tirade. In Incognito, accusations are made against the Muslims - saying they've kidnapped the Pope - but it comes to light early on that the Muslims are not responsible for the travesty at all, that they are being targeted as part of a bigger picture. Given the current political climate, especially in Europe, with Islamophobia at an all time high, it is my belief Talib wrote Incognito in the hopes of educating others that everything is not necessarily as it seems, regardless of what may be broadcast on the news or printed in newspapers. Deceit can come from any person, at any level of an organization or in society, itself. Just because a person wears a set of stripes, a uniform or other insignia doesn't mean he/she is the person who will help in a crisis, especially from a legal or political standpoint. Furthermore, I believe Talib wants people to realize that not all Muslims are terrorists or prepared to become a victim of a suicide bombing. Many Muslims live with a heart filled with peace which seems to get overlooked because of the stigma now associated with being a Muslim in the western and European worlds. Granted, there are Muslim terrorists - just as there are Caucasians and terrorists from other nationalities around the world - and they are filling the hearts of people across the globe with fear and uncertainty about tomorrow. However, despite the havoc they wreak, they form the minority of the population and not everyone from every nationality should be painted with the same brush. It has been a pleasure acquainting myself with Khaled Talib's writing and I will be sure to read other titles as time permits. If you are interested in checking out Incognito - a book which will take you on an international journey into places you may never otherwise visit - you can visit its page on Amazon.